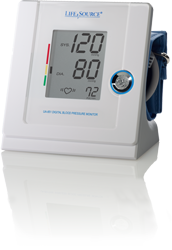 The UA-851 also features the LifeSource® exclusive Pressure Rating Indicator™, which takes the guesswork out of blood pressure measurements by color coding each reading according to the JNC7 guidelines, and Irregular Heartbeat Detection, which will provide users with an accurate blood pressure reading even if an irregular heartbeat is detected. Along with a 90 reading memory capacity, and a lifetime warranty on both the cuff and monitor, the UA-851 is truly an innovative and stylish new approach to blood pressure monitoring. Available in medium and large AccuFit™ cuff sizes only.